It has taken me longer to tell my tales of my Turkish vacation than I intended but I have to admit, ding this post now was probably just what I needed! 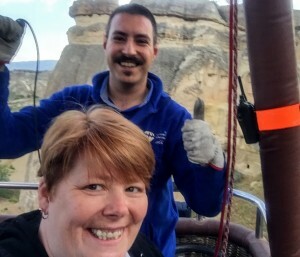 I wrote a post about my uncertainty about doing a hot air balloon ride but I want to assure you that it was a truly amazing time from start to finish! 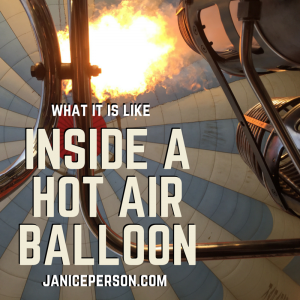 In this post, I’ll share my thoughts about my first hot air balloon ride and some of why I feel certain it will not be my last! I spent our flight in the part of the basket closest to the pilot — Oguzhan Ayata. He was really friendly and willing to help us understand some things. He explained that he had gone to college to study ballooning and puts that education and experience to work really early in the morning. He looks at lots of weather information to understand the winds that are in the area and at various elevations. Everyday he studies that information and chooses a takeoff spot. He also charts a new course in part due to those differences. It was interesting to have him tell us his plan, admitting that sometimes things change in route but our flight seemed to follow exactly the route he planned. He uses the heat to make the balloon go up and down and relies on wind currents to move the basket all other directions. It was interesting that because the basket we were in was rectangular, he told us the basket would slowly turn, allowing us all to have a great view as we go. The rotation all seemed perfectly normal — heck we were spinning our heads anyway! But I have to say it was fairly unique when I watched the video that was shot from a camera mounted on the basket (mounted between the radio & the burner so the sounds from them are stronger than they were in the basket generally). 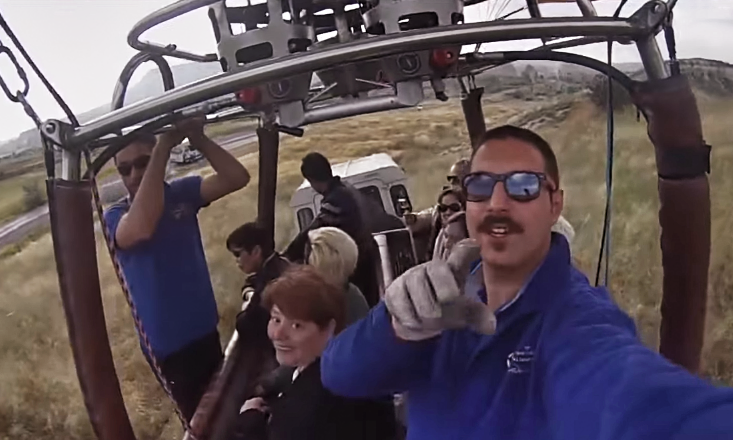 The ballooning experience was a great compliment to the full days with a professional guide. 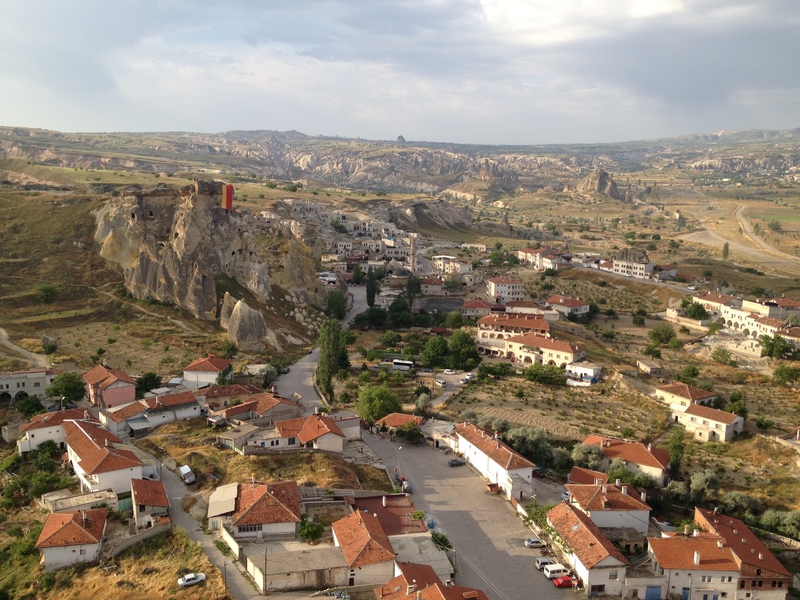 When you are in a part of the world that has as rich a history as Cappadocia, it helps to get a couple of takes on the story! 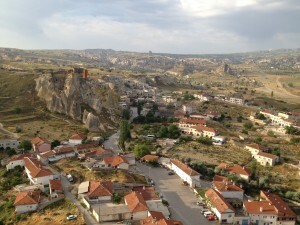 We were able to see the Goreme Open Air Museum and Pashabag which I had toured the previous day. 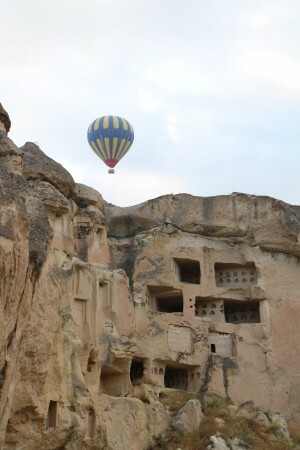 The caves in the area have been in use for thousands of years. and walking up and down the steps, and around the rock formations that make Pashabag fairy chimney central, was one thing but to see it from above was different, especially as Oguzhan explained the volcanic eruptions that helped create the area’s uniqueness. Seeing it from a distance, taking in all the colors and patterns. We also saw the town of Avanos where the citizens had long lived in caves but during the last few decades saw erosion creating more rock slides, so a small town was built on the surface. It was in this area that I also learned a good bit about some of the farmers do. Bees in Caves — I saw boxes up in the caves and had to ask about them…. it was bee hives! Loved seeing them. I pointed that out and checked with him and Oguz said they were indeed. Vineyards look different — The ground close to the rock formations looked pretty rocky & sandy. That’s not great for some crops because the soil doesn’t hold fertility very well, but it seems to work well for grapes. 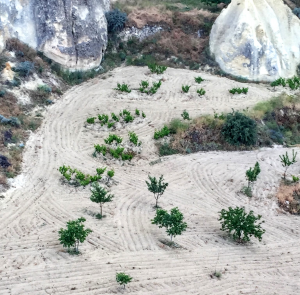 It was interesting that vineyards in Cappadocia don’t trellis the grapes and instead leave the plants to grow on the ground. I will add that I had some good wines from this part of the world too! Raking the soil — In some places, you could see that the farmers had been raking the soil in circles and lines, much like the rock gardens in Japan. I’ve seen it done for weed control but Oguz pointed out that aeration is also improved with this. A few different crops — I caught sight of grapes, onions, wheat and some tree fruits. I appreciated Oguz telling me that pilots work hard to land in fields that aren’t currently planted to crops. In fact, you can see us coming close to some fields and pastures on our landing but we successfully avoided them! Smaller scale — I couldn’t help but also notice that we flew over the homes of some farmers, seeing tractors that sometimes are the primary means of transportation for a family. I know a few times I saw families running errands via tractors rather than simply doing field work. As we talked it seemed clear that life as a farmer is pretty tough in this part of the world with lots of manual labor needed. The pilot of our flight had a GoPro camera and we could buy the video if we wanted…. I figured this was potentially a once in a lifetime trip so I may as well! I didn’t watch it for a few weeks and am really glad I got it now as I so enjoyed the full reminder this weekend. I tried to cut it down really short but the diversity of the geography we were looking at made it hard. I got it down to 10 minutes. Some of the time you will be able to hear Oguz tell you some of the pieces of information he shared with us or those of us in the basket chatting. You will also hear the burner and some radio chatter. As I put this together, I thought about some of the different things I would capture… I could go on and on! 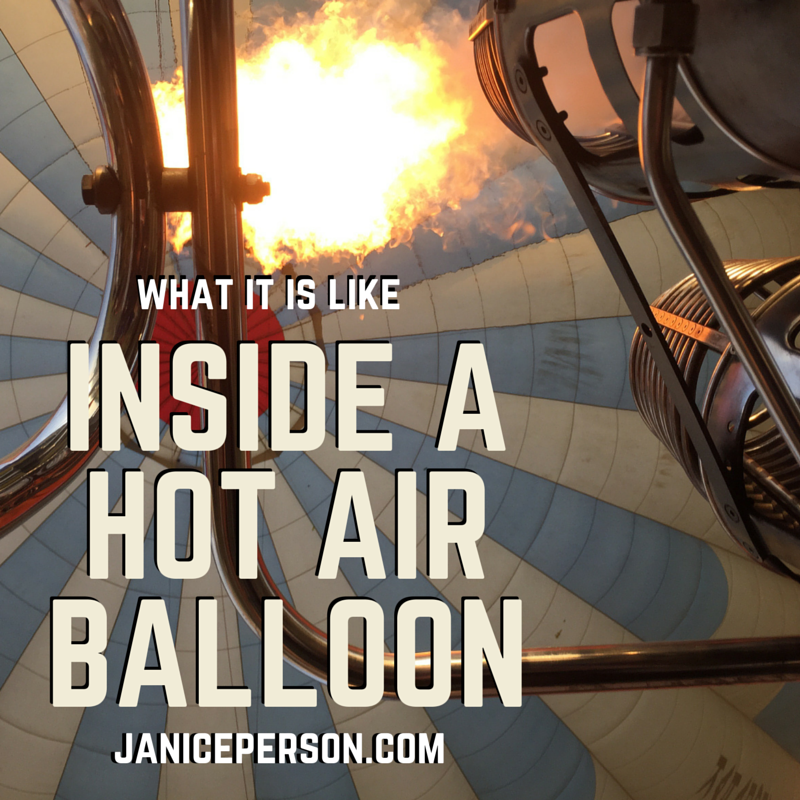 But I kind of think that maybe I should call this post complete and then do a post of the questions you have about hot air balloon rides. Not sure I can answer all the questions I get, but I will sure give it a shot on the questions I have answers to! So feel free to leave me a comment weighing in — about the trip in general or specific to Cappadocia. I figured this was potentially a once in a lifetime trip so I may as well! What have you learned from your solo trips?